Industrial manufacturing veteran William Ahern brings front-line expertise and quality control experience to DUNMORE's film contract manufacturing (http://www.dunmore.com/services/contract-manufacturing.html) services program, focusing on coating and lamination. “William Ahern has deep knowledge of both ends of the process – the customers’ needs and DUNMORE’s capabilities,” said DUNMORE Executive Vice President of Operations and R&D Tom Rimel. DUNMORE Corporation announces the promotion of William Ahern to a new position, created to expand the scope of its formal film product development process. 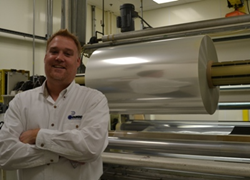 Ahern, a 15-year veteran of industrial manufacturing and quality control, was selected as the new development specialist focusing on film contract manufacturing services (http://www.dunmore.com/services/contract-manufacturing.html). Ahern is responsible for managing the transition of coatings and laminations sourced from outside manufacturers that are applied to film on DUNMORE’s production lines. This new position expands the company’s formal development and scale-up processes, making DUNMORE an ideal contract partner for companies that are facing capacity constraints or are looking to expand product portfolios. The development process pairs DUNMORE’s technical team with customers' counterparts to speed the time to market by clearly defining product requirements upfront and providing real time feedback to ensure all milestones are met. The scale-up process includes lab-to-pilot and pilot-to-production scale-ups, providing essential outputs and validation while minimizing the total cost of development. Ahern joined DUNMORE in 1997 and was immediately identified as a high performer; shortly thereafter he was chosen to be part of a select team of six to facilitate the transfer of DUNMORE’s Pennsylvania manufacturing facility and headquarters. During the transition, Ahern balanced lead manufacturing and purchasing roles. The operation groomed Ahern for the Quality Systems Manager position for its Pennsylvania and New York manufacturing facilities. As Quality Systems Manager, Ahern guided the Corporate Quality Management System and managed a 10-person testing and conformance staff that monitored quality performance. DUNMORE Corporation is a global supplier of engineered coated and laminated films and foils. DUNMORE offers film conversion services such as coating, metallizing and laminating along with contract film manufacturing (http://www.dunmore.com/services/contract-manufacturing.html). DUNMORE produces coated film, metallized film and laminating film substrates for the photovoltaic, graphic arts, packaging, aerospace, insulation, surfacing and fashion industries. DUNMORE is privately held, ISO 9001:2008 and OSHA VPP Star certified. For complete information on DUNMORE’s products, services and industries served, please visit DUNMORE’s website http://www.dunmore.com/.